"We are cold and we are tired and we want out power now," said one Long Island resident. She said LIPA, the utility company, hasn't worked quickly enough. NBC's Michelle Franzen reports. Hundreds of volunteers got on buses at City Hall on Saturday morning to make their way out to areas still struggling from Sandy's devastation. Mayor Michael Bloomberg dedicated Saturday a day of service as volunteers spent the day distributing aid and helping with storm recovery efforts. "It's time for us to help everybody back," said New Orleans mayor Mitch Landrieu. After Katrina, firefighters from New York and New Jersey lent a helping hand, so residents of New Orleans are sending both necessities and messages of hope to those impacted by Sandy. NBC's Janet Shamlian reports. Teams cleaned up the beach and boardwalk in Coney Island, handed out food and water and helped with the cleanup on Staten Island, and hosted a clothing drive and children's carnival in Rockaway. In a church parking lot on New Dorp, Staten Island, Walt Street cooked food for storm victims. Street, who had driven 30 hours from New Orleans, Louisiana to pitch in with relief efforts, said the scenes he was seeing on Staten Island reminded him of his hometown after Hurricane Katrina. On Long Island, about 300 people staged a rally in front of the Long Island Power Authority's office in Hicksville Saturday. Approximately 130,000 homes and businesses were still without power on Long Island. Coney Island's New York Aquarium is filled with wonders from the sea, but during Hurricane Sandy the ocean devastated it. NBC's Mara Schiavocampo reports. Gov. Andrew Cuomo has called for an investigation of the region's utilities, criticizing them as unprepared and badly managed. On Friday, two congressmen from Long Island called for the federal government to help LIPA restore electricity. "It's a totally disorganized effort, and LIPA unfortunately seems to have lost control of the situation and that's why you see so many people becoming so angry,'' Rep. Peter King said Saturday. LIPA chief operating officer Michael Hervey said they were aware customers haven't gotten the information they've needed from the utility, partly because of an outdated information technology system they're in the process of updating. "I certainly feel the frustration of customers whose power remains out. Our hearts go out to them," Hervey said. 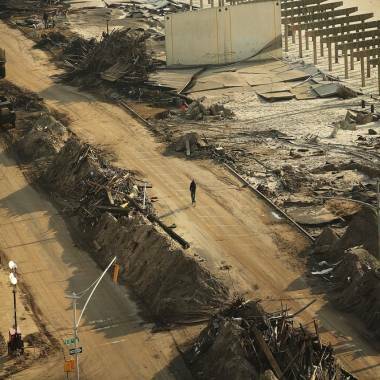 A cyclist passes piles of debris Saturday, Nov. 10, as cleanup continues where a large section of the iconic boardwalk was washed away in the heavily damaged Rockaway neighborhood of the Queens borough of New York City. But he said workers are repairing unprecedented storm damage as fast as they can. About 6,400 linemen and 3,700 tree trimmers are at work, compared with 200 linemen on a normal day. In New Jersey, Gov. Chris Christie said he expected power to be restored across the state by Saturday night. As of Saturday evening, Jersey Central Power & Light had nearly 62,000 customers overall without power. Public Service Electric & Gas said 5,580 customers remain without power from the hurricane. Another 17,148 customers -- including those who lost electricity during the nor'easter and in recent days -- were also awaiting restoration. About 100 Orange & Rockland customers had no power, while Atlantic City Electric had roughly 2,480 outages. Con Edison said just under 20,000 customers were without power, with just under 9,000 of those outages in Westchester county. Virtually all utility customers in Connecticut have had their power restored. Cuomo announced Saturday that New Yorkers who lost their job or income because of Sandy would now have until February 4, 2013 to apply for federal disaster unemployment assistance. Claimants also now have up to 90 days to submit proof of employment or self-employment and will be provided an IRS link to speed up the retrieval of lost or destroyed tax documents. New Jersey moved about 200 people from tents at the Monmouth Park Racetrack into the track's four story grandstand building. The storm victims were initially staying in a camp designed for out of state utility workers, but the state came under fire after photos emerged showing people huddled together in snow covered tents. The Statue of Liberty was illuminated for the first time since Sandy, after the storm caused significant damage to statue and to Ellis Island. The dock at Liberty Island that welcomes visitors was so badly damaged it might have to be rebuilt, officials said. The statue's interior had just reopened to the public before the storm hit. No word yet on when the statue will open to the public again. Cuomo announced the MTA will resume service on the A subway line to Howard Beach Sunday. A shuttle bus will run from Howard Beach to Mott Avenue in Far Rockaway until the heavily damaged north channel bridge can be repaired. Rockaway will also get temporary weekday ferry service into Manhattan starting Monday. Mayor Bloomberg announced the trips will cost two dollars each way. The ferries will make five morning rush hour trips to Pier 11 in lower Manhattan starting at 5:45 a.m., and five evening trips back to Rockaway. Free transfers from Pier 11 to the East 34th street midtown ferry terminal will be made available. President Barack Obama will travel to the New York area next week to view the recovery from Sandy and thank first responders, the White House announced Friday. The president is set to make the trip on Thursday. Obama visited the Jersey Shore last week after Sandy pummeled the tri-state, telling storm victims: "We are here for you and we will not forget. We will follow up to make sure you get all the help you need to rebuild." At the time, Bloomberg said he told Obama's chief of staff that the city "would love to have him, but we've got lots of things to do." On Friday the mayor said "we've made significant progress since then and we're happy to have him." Cuomo also announced the creation of the Empire State Relief Fund, intended to help residents repair and return to homes flooded and damaged when the storm hit last week. He says the best temporary housing is permanent housing and it's cheaper in the long run for taxpayers. Bloomberg also announced a Sandy repair program, called NYC Rapid Repairs, aimed at getting as many people as possible back into their homes by year's end. Starting Tuesday people with storm-damaged homes can go to a city restoration center, get a Federal Emergency Management Agency number and sign up. Then a contractor will go to the person's home, assess the damage and "within a short time, the work will be done," Bloomberg said. 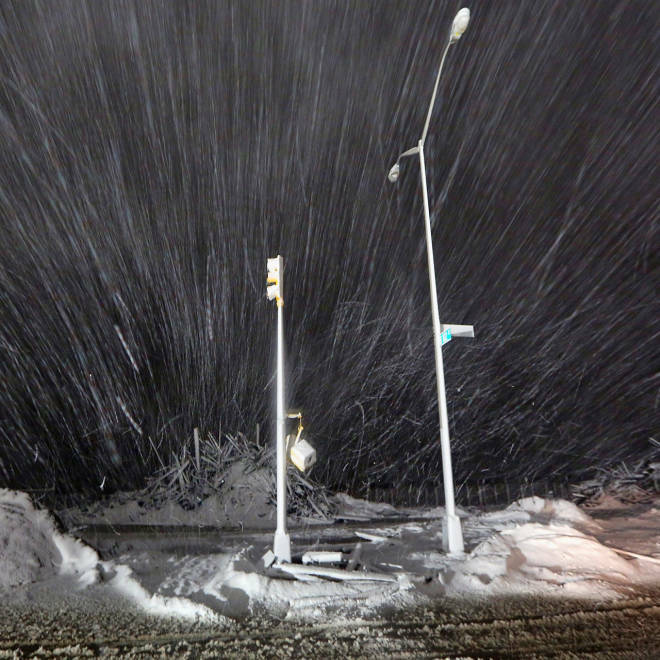 A snowstorm hits the Northeast as residents are still struggling to pick up the pieces after Superstorm Sandy.